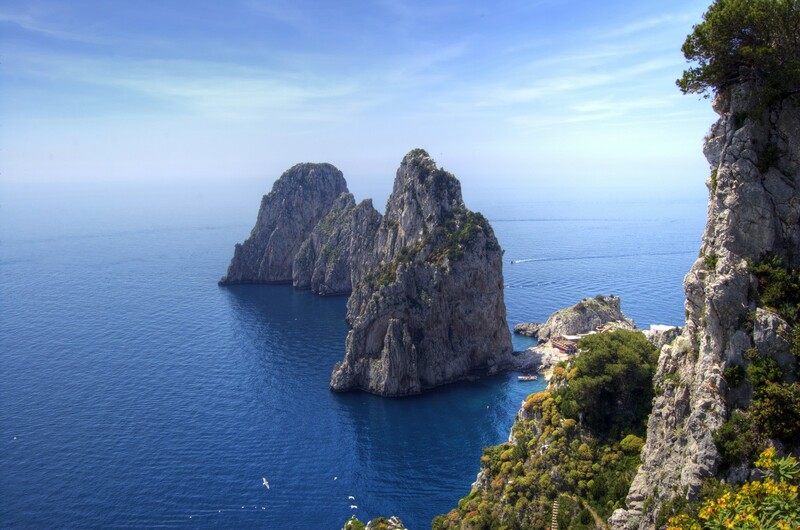 No holiday on the Amalfi Coast would be complete without a trip to the evocative island of Capri. Whole day tour escorted by guide. Sailing by steamer. On arrival in Capri (Marina Grande) you will reach Anacapri by private coach. Free time for shopping and optional visit to the Villa San Michele of Axel Muthe, a famous Swedish writer, author of "The Story of St. Michael". The Villa built on the remains of Romans ruins, gives the opportunity of an impressive view of the island from its splendid gardens and its beautiful terraces. Optional lunch, then to Capri town. Visit of the famous Piazzetta and walk to the Gardens of Augustus overlooking the famed Faraglioni Rocks and Marina Piccola, passing through the most elegant street of the island with famous boutiques and jeweller's shops. Return to the harbour on time to board the steamer. Departures: Wednesday and Friday 8.30 a.m.